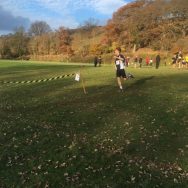 Once again, Milly and Josh represented Ruthin at the Denbighshire cross country championships held at Ysgol Dinas Bran, LLangollen. Unlike previous years, the weather had been kind prior to the event, the ground was good and running was easier in the absence of mud. Both students were competing in a higher age group than last year and were apprehensive about running against Year 11 students. Competing against teams of eight from all the Denbighshire Schools, Milly took her position on the start line. Her recent experience of running in Club competitions showed as she was composed and quiet as the starter settled the competitors. 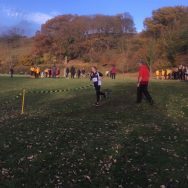 Within the first fifty metres Milly was in fourth position and by the second lap of the first field she appeared over the brow of the slope in second. 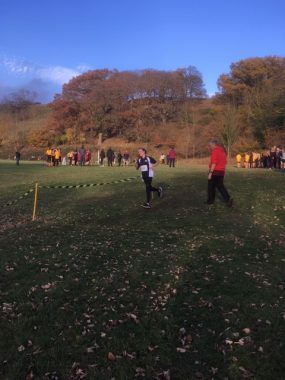 Most of the course is out of sight from the spectators’ position and on entering the field for the final time and heading towards the finish line, Milly was in the lead. She produced a good tactical race and a well-deserved first place finish. Josh had played in a School football match the previous day and was carrying a slight calf injury. An apprehensive Josh walked to the start line. After the first lap, he was well placed in ninth position and running well. On the second lap he continued to move up through the runners and on the final lap he entered the funnel in fifth position, or so he thought. A tired Josh handed in the ticket and was surprised when told he had achieved fourth place. Both Milly and Josh will represent Denbighshire at the North East Wales Championships early next term.